Much of the Colts’ 19-17 win over the Seahawks was devoted to young players doing foolish things, but Seattle’s opening drive was exactly how Pete Carroll had fantasized. In the Seahawks’ first possession that became a 75-yard touchdown drive, 32 yards came by the run, 43 came by the pass. If you have any urgency to derive meaning from the first exhibition game, we offer that morsel as an indication that the plan to restore dignity to the Seattle ground game has taken a toddler’s step forward. 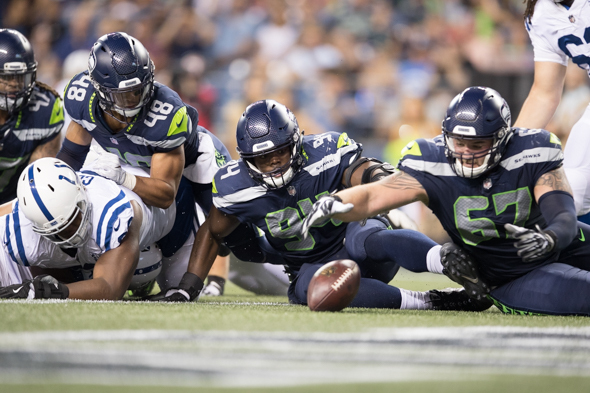 Much of the rest of Thursday night’s bumper-thumper at the Clink between the Colts and Seahawks was a Benny Hill lowlight reel, including four penalties on the Seahawks offense in three consecutive plays, and a wild snap — one of seven Indianapolis fumbles — late in the fourth quarter by the Colts that went 29 yards into the end zone. The Seahawks recovered the passed ball for a touchdown to close the deficit to 19-17, which stood as the final score because the well of weirdness had run dry. But the opening drive with the first unit offense was close to ideal. Four scrimmage runs from the backs tandem of Chris Carson and Rashaad Penny, two non-panicky scrambles by QB Russell Wilson, as well as four completions in five pass attempts, including a five-yarder for a touchdown to Nick Vannett, produced a drive of balance and order largely absent from a year ago. “A perfect start for the offense,” said coach Pete Carroll, claiming new offensive coordinator Brian Schottenheimer “mixed it just right to get us down the field. We didn’t open the playbook for this game, we just wanted to check some stuff out, hoping we’d get a drive instead of three-and-out. For the game, the Seahawks ran for 87 yards in 22 carries, including 26 on four runs by Carson. Modest, yes, but in the right direction. Speaking of the right direction, the defensive star was the people’s choice, rookie LB Shaquem Griffin, who had six solo tackles and three assists, including a tackle for loss. The fifth-round pick came in on the second series and played much of the rest of the game. “He was all over the field, making hits,” Carroll said. “We played him a ton. He was running and hitting just like he’s been looking in practice. Very encouraged. I can’t tell you much until I see the film, other than he was very active. His praise included rookie pass rushers Rasheem Green and Jordan Martin, part of pressure that delivered three sacks to Colts quarterbacks, including Andrew Luck, seeing his first game action since 2016 because of a passel of injuries. National anthem kerfuffle, year two — Seahawks DLs Quinton Jefferson and Branden Jackson and RT Duane Brown stayed in the tunnel during the anthem, per the NFL’s off-season request, to carry on the social-injustice protest from last season. But no Seahawks sat on the bench, knelt or raised fists, actions that reportedly occurred at other stadiums as the preseason got underway without a compromise that works for owners and players. Carroll said a team meeting was held to discuss the matter. New kickoff rules — Aside from a lot of touchbacks, RB J.D. McKissic had returns for 29 and 30 yards, and WR Cyril Grayson, the former college track star, had a return of more than 50 yards wiped out by a holding penalty. Injuries — The backup tackle depth took a hit when Isaiah Battle ( sprained knee) and rookie RT Jamarco Jones (sprained ankle) had to come out of the game, the latter on a cart. WR David Moore was hit in his facemask as he fell defenseless after a helmet hit by CB Shamarko Thomas, who was penalized and ejected. RB C.J. Prosise added another absence to a long list when a hip flexor bothered him in the final practice before the game and was held out. Shaquem Griffin, pass coverage — It was not all roses. Whe he dropped into coverage in the first quarter, he was knocked back by a two-handed push from Colts TE Jack Doyle, who cleared space for a nine-yard reception. Rookie CB Tre Flowers — Long and lean like Richard Sherman, Flowers started in place of injured Byron Maxwell (hip flexor) and held up, although he was caught with a pass interference penalty. Jon Ryan vs. Michael Dickson— The rookie may have had an edge in the punting competition. He had a solid directional punt downed at the Colts 14, and a high 55-yarder that was impressive. In the fourth quarter, Ryan had a fairly weak 38-yard punt. Germain Ifedi vs. NFL law — A year ago, the right tackle was the Paul Manafort of football players, breaking rules in myriad random piles. But in limited action, he got away clean Thursday. Art, if Prosise can’t get into the games during preseason do you think the Seahawks are done with him? He shows flashes of talent when he plays; but he plays so infrequently. They love his talent, but not on the sidelines. If they have three backs they like plus McKissic for returns/third downs, they likely will cut him. I think Prosise is gone, I have a friend of mine who played for J Paterno and has good insights on football. He mentioned 1 time, 1 of the biggest and most important thing is being ….. available. Prosise is the very definition of not being available. I can’t back this up with any stats but from a very non-statistical pov, I’ve noticed in most sports, when a player is prone to be injured, that never goes away when he ages, in fact probably gets worse. We use to have Sami Salo who played for the Vancouver Canucks and the man was a good player but he would hurt himself walking up a flight of stair….that’s no joke, it happened 1 year. The team would spend an excess amount of time just trying to plan around his eventual injury. Great character guy that just happens to be made out of glass. I don’t believe in the phrase injury prone, unless an athlete has a chronic disorder, which means he’s unlikely to succeed as a pro athlete. Most of the time consecutive injuries are coincidental, but we humans always must find connections, reasons and conspiracies. We simply cannot accept life’s randomness. I’m tempering my enthusiasm with the fact that the Colts were horrific on defense last year, but it feels like it’s been two years since I saw them drive the ball like that on a first drive. Last year’s team couldn’t pull off a drive like that against air. In your constant attempt to solely blame Trump for this mess, you conveniently forget it all started under Obama. I doubt Art forgot that; I think the point is that it’s a kerfuffle because of Trump. Indeed Trump picked the fight. Obama had other things to do beside use sports to divide people and sow chaos. The chaos came when the first knee was taken during the National Anthem. Trump calls people out for their BS. Since Trump didn’t start the kneeling it isn’t on him. And FWIW I agree with Trump – take a knee and the ownership approves and reap the whirlwind! No more NFL for this guy!When do the Dawgs kick off for the season? College ball for me! No more NFL. Trump hasn’t called out his own BS – avoiding Vietnam with student and medical deferments, for bone spurs on his heels, no less. Real patriotic guy, that Trump. Pfft! Didn’t every bad thing start under Obama? For the Trump and Anon crowd, EVERYTHING bad started under Obama. The good economy just started under Trump, didn’t you know that? Though FACTS tend to show recovery started under Obama in 2008 and had several qtrs of 4% growth. But what the heck with the Trump crowd, facts don’t matter. If you’re going to post facts and figures you should make very certain that you are posting the right numbers. Obozo never did hit 4% GDP. Yeah, he was that bad!!! But one quarter of 4.1 percent real growth — after accounting for inflation — is neither a record nor close to one. In fact, there were four quarters of higher growth during just the Obama administration, including one quarter of 5.1 percent growth in 2014. I could create the illusion of prosperity also if I could write trillions of dollars in bad checks. and how did it start under the racist President Obama? Did Obama tweet this fake outrage? Oh I forgot, the Twit-in-Chief did that. I’m quite sure Trump does not even know the national anthem. 1 of the video caught him attempting to sing it and it doesn’t appear to be the right words. IMHO, the first string offense and defense did well overall. But the backups not so much. Weak pass rush, less than stellar pass coverage and mediocre-at-best pass protection. Also, the team ended up with 12 penalties for 98 yards compared to the Colts with 5 penalties for 45 yards. I haven’t heard PC express any concern about this, which has burned the Hawks for years.. The only bright spot in this area is that Ifedi didn’t commit any penalties, which you pointed out, Art. The pens are largely a product of newbies in their first contact game, as was the sloppiness of the backups. And this year, six coaches are new, so patience is required. But how would we know you’re a patriotic American if you don’t join an organized gesture at ballgames? I think your boss should insist on it every day you enter the workplace.